“We shall never forget the courage of those who defended our freedoms. The human cost of war is incalculable. May the peoples of the world learn to solve their problems peacefully.” Major Frederic Arnold, Retired US Army Air Corp Fighter Pilot WWII. At 94, Maj. Fredric Arnold (ret. ), Sole Surviving Member of his WWII P-38 Class of 42J Group, is Sculpting A Monumental Bronze Sculpture in Memory of the more than 88,000 WWII US Airman Killed in Action. UPDATE: Major Arnold finished his sculpture! It was unveiled at the Wings Over the Rockies Air and Space Museum on August 6, 2016. 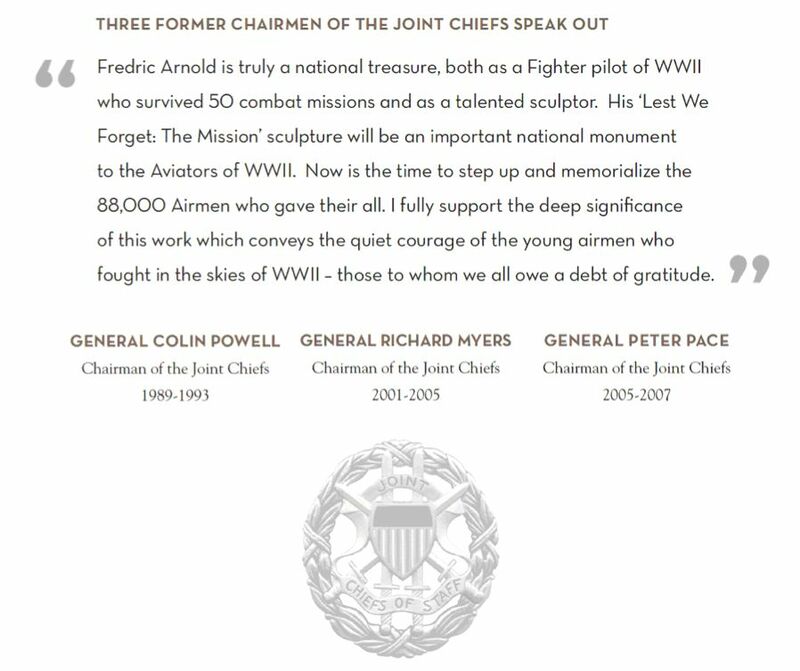 Click here to visit the Major Arnold’s own project website to see the finished sculpture and watch the movie on the homepage to more fully understand the significance of this monument. Ever since my early childhood, I’ve been an artist. Fine art. Commercial art. You name it. This project, however, is special. It is my magnum opus… The most challenging from an artistic point of view, but more importantly, the most meaningful to me. I put my heart and soul into this work. The narrative below describes the overall origins of this sculpture. Bear in mind, however, it is comprised of twelve individual figures. Each figure has its own story and its own meaning. I hope you’ll also take the time to read each of the twelve stories posted under the “Gallery” menu heading. Here is the background behind this work of art: Of fourteen original members of my original group of Class 42-J P-38 fighter pilots, only two survived six months of combat: Jim Hagenback and me. Much of our survival was due to luck. Years later, we vowed to each other that whoever was left standing would do something to honor the twelve. Lest We Forget: The Mission stemmed from our deep gratitude to the twelve original members of our Group that didn’t survive to live their lives in peace. At 94, I am the last man standing of my original group. Completing the sculpture in August, 2016 fulfilled my oath to honor my comrades. To my knowledge, I am the only commercial artist to live through combat as a US WWII fighter pilot in the North African theater of operation. Turning to my art, the idea of the sculpture grew out of an intense memory of the quiet bravery of my comrades attending a mission briefing as we recommitted to executing the day’s mission, even while flanked by the memory of our fellow pilots killed in recent combat. Although the sculpture began as a testament to the twelve pilots in my squadron, the scope of the work has grown. Now the twelve individuals figures are dedicated to the memory of the more than 88,000 U.S. aviators who gave their lives during WWII. 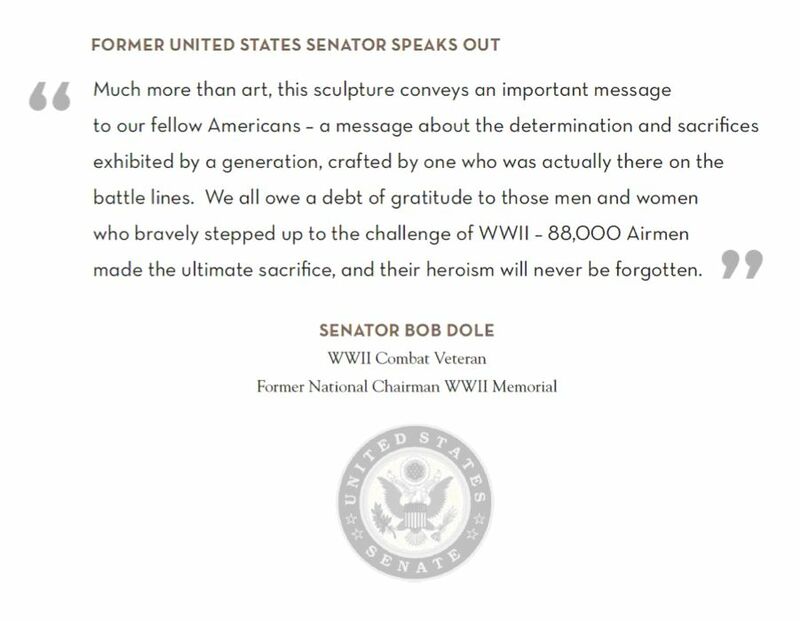 I am honored that three former Chairmen of the Joint Chiefs of Staff and a former Senator have endorsed the deep meaning of my sculpture. Arrangements have been made to loan Lest We Forget: The Mission to the National WWII Museum in New Orleans for exhibition on their 6-acre campus. The sculpture depicts twelve fighter pilots during a mission briefing. The lighter colored spirits of aviators already killed in action look over the shoulders of those still alive. All are destined to die. Please view the Gallery pages on this website to see images of the life size figures completed in clay. Over the last four years, the figures were cast in bronze and are now on display in Denver. My family and I paid to complete this project. We are hopeful the public will see the value in my work and help us offset the project costs through tax-deductible donations. If you have an interest in helping with this project, please visit our Donate Page. I invite you to watch the videos on this site to hear about the history and significance of my project. This story was suggested by FASF Aviation News Scout, James Purcell, of Detroit, MI. This entry was posted in AVIATION NEWS on September 30, 2016 by FASFRIC.